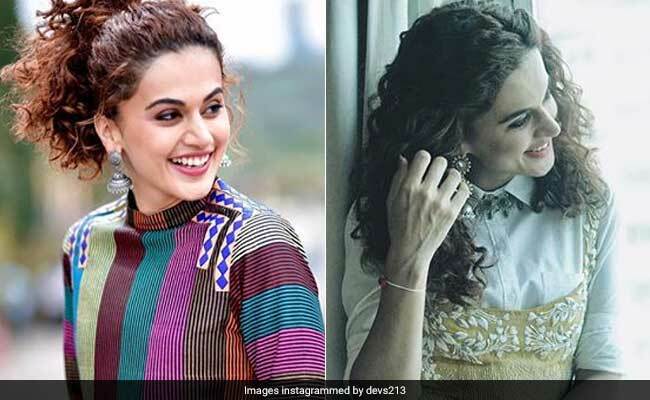 Taapsee Pannu’s style is quite unique – all you have to do is scroll through her stylist’s Instagram page and you will know how Tapsee’s outfits stand out. There is always something quirky and a dash of innovation in whatever she wears. In the past, Taapsee has worn everything from a dress with an interesting cut to an unconventional saree. She usually goes for outfits that are a fine balance of cool and classy. The latest addition to her list of fun outfits is a peplum top. This morning, Taapsee stepped out for a promotional event for her upcoming movie Manmarziyaan in a bold and colourful peplum top by ParamSahib. The striped block printed , appliqué chanderi crop top was not only an offbeat mix of prints and geometric motifs but also looked quite festive. As many times before, Taapsee wore an elegant pair of silver jhumkas to complete the look. This was second time in two days that Taapsee wore a peplum top, only difference being that she wore one with a twist yesterday. Dressed for a promotional event in Ahmedabad, Taapsee wore a Ek Soot peplum cropped vest over a Derek Lam white shirt. She completed the look with a statement necklace that she wore over her shirt and under the collar; she also wore a pair of pretty Azotiique earrings. Pairing the pastel mustard yellow vest with the white shirt was a good call because the two pieces look nicely put-together, and not contrasting with each other. That is one of the major reasons why the pairing worked out for Taapsee. We sure love how experimental Taapsee gets with what she wears since it works out well for her almost always. Keep the quirk going, Taapsee.